Frasers Hospitality Trust - Potential Upside to NAV Soon? Frasers Hospitality Trust’s 1Q19 DPU of 1.2542 Scts (-4.3% y-o-y) in line with expectations. Lower contribution from Malaysia and Japan. Potential sale of Sofitel Wentworth could crystallise S$170m profit and lift NAV per unit by over 10%. Maintain BUY, Target Price of S$0.78. 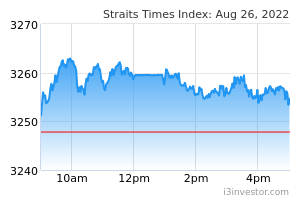 FRASERS HOSPITALITY TRUST (SGX:ACV) had a soft start to the year with 1Q19 DPU falling 4% y-o-y to 1.2542 Scts. Nevertheless, this is in line with expectations, with 1Q19 DPU representing 26% of our FY19F DPU, within the 26-28% usual season contribution for 1Q. The decline in DPU was attributed to weaker performance from the Malaysian and Japanese operations. This also contributed to 1Q19 revenue and NPI dropping 2% and 1% y-o-y respectively. 4Q18 NPI for Malaysia fell 34% y-o-y to S$1.2m as the Western Kuala Lumpur faced the twin challenge of an increase in new room supply and weak corporate demand. This resulted in RevPAR falling 12% y-o-y. Combined with lower F&B revenue, gross operating revenue (GOR) and gross operating profit (GOP) fell 12% and 31% y-o-y respectively. Going forward, we understand the KL market will remain challenging. Meanwhile, Frasers Hospitality Trust’s Japan property ANA Crowne Plaza Kobe, suffered from the residual impact from recent renovations to the ballroom wall, despite steady room revenue given stable RevPAR of JPY12,148. On the back of lower banquet revenue, GOR and GOP fell 4% and 14% y-o-y respectively, translating into a 14% drop in 4Q18 NPI. Frasers Hospitality Trust’s core Singapore operations (24% of NPI) had a relatively stable quarter with NPI dipping by 1% y-o-y to S$6.5m. Overall GOR and GOP was flat despite portfolio RevPAR falling 2% y-o-y owing to higher F&B revenue. We understand InterContinental Singapore continues to face increased competition from the nearby JW Marriott and Andaz hotels. Meanwhile, the German operations also reported a modest 1% drop in NPI to S$1.6m, largely due to a drop in the EUR. 1Q19 NPI for the Australian portfolio (42% of NPI) jumped 4% y-o-y, underpinned by GOR and GOP rising 6% and 7% y-o-y respectively in AUD terms which offset the impact of a depreciating AUD. The robust performance was driven by 2.6% y-o-y lift in RevPAR to A$234 and the return of the full room inventory at Novotel Sydney Darling Square post recent refurbishments. Considering the new supply entering the Sydney and Melbourne market, the performance of Frasers Hospitality Trust’s Australian assets was particularly strong. Despite the overhang from Brexit, the UK properties (15% of NPI) delivered the fastest NPI growth of 14% y-o-y among Frasers Hospitality Trust’s global portfolio. The jump in earnings was primarily due to a 9.2% y-o-y increase in RevPAR to GBP105 on stronger demand. Frasers Hospitality Trust’s gearing was relatively stable at 34%. However, due to FX fluctuations, NAV per unit fell to S$0.75 from S$0.78 in 4Q18. The proportion of fixed rate debt was also stable at 73.5%. In FY19, Frasers Hospitality Trust has S$385m of debt due and post refinancing there is potential for overall borrowing costs to remain close to 2.5% should Frasers Hospitality Trust increase the proportion of EUR-denominated debt. Based on press reports, Frasers Hospitality Trust is exploring the potential sale of Sofitel Wentworth Sydney. Should this occur, it would be consistent with Frasers Hospitality Trust’s previous guidance that it intends to reposition its portfolio and recycle capital into higher-yielding or faster-growing assets. As at end-4Q18, Sofitel Wentworth Sydney was valued at A$307.9m with the valuers using a 6.25% cap rate. This compares to the original purchase price of A$224m. Should the hotel be sold at a 4% cap rate or lower, generating S$170m in profits, there would be more than 10% upside to Frasers Hospitality Trust’s current NAV of S$0.75. 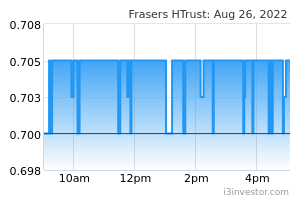 Although Frasers Hospitality Trust had a soft start to the year, we believe there is still potential for FY19 DPU to be marginally up, due to the low-base effect from declines over the last three years, likelihood of one-off events such as two typhoons to not reoccur, and impact from recent AEIs (Novotel Rockford Darling Harbour). These, combined with capital gains being generated from the potential sale of Sofitel Wentworth Sydney, keep us favourably disposed to the stock. Thus, we maintain our BUY call and Target Price of S$0.78.